Join us in congratulating our Mod of the Month for February: Lara G! Lara is one of our fantastic bilingual mods, hailing from the beautiful city of Torino, Italy (which you may remember from the 2006 Winter Olympics). She has been with us since July 2013, and was referred to us by a friend. Strangely, it took her a long time to buck up the courage to actually apply, as she thought she wouldn’t be hired. Nevertheless, she did apply and we’re so happy to have her. Lara is always concerned with attention to detail (although, she believes she’s a little too committed and attentive to details – which we think is a great trait in a mod). Lara loves to make people smile, and loves playing with languages. In addition to [Lara’s] regular mod responsibilities she has a great eye, and picks up trends which could become issues and reports them to the appropriate point of contact. This is exactly what our client is looking for in a mod and she exceeds expectations on a regular basis. She also repeatedly noticed potential mistakes in pre-formulated content from the client before it went public, saving everyone involved a lot of stress. Her friendly and humorous nature is always appreciated in our team chat. Lara is an outstanding mod, always willing to give a hand where needed and her reports are already spot on and on time. She has excellent communication skills and is an asset to my team. Lara works for me on one of my projects and always steps up. She asks good and appropriate questions, and then implements the answers. She is flexible when any changes need to be made, and adapts them quickly and without complaint. Lara always has an upbeat, fun and welcoming personality. And she loves her job. 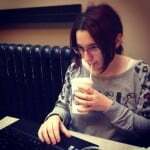 Aside from her work as a Mod, Lara is always ready and willing to volunteer and write blog posts for us. Her posts are always heartfelt, thoughtful, and are a fantastic representation of what makes our Mods great. Congratulations, Lara! We’re so thankful you’re on the team. This entry was posted in Mod of the Month, Mods and tagged Mod of the Month, mods, working remotely by ModSquad. Bookmark the permalink.